This PWM is a fully digital version of the current limiting design. This is a good design for commercial applications and for an impressive way to show off any HHO system. With this model you can adjust and monitor your system settings remotely from the cab of the vehicle. The circuit board is installed in a ventilated box complete with cooling fan. Inside the board also has heat sinks attached to the critical electronics to keep them cool and reliable. The remote LCD controller display comes next. It connects to the PWM via a Cat-5 computer cable. This allows you to mount the display in a convenient location and make adjustments easily. 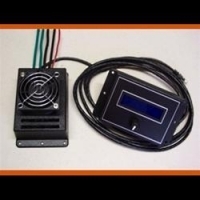 The display shows amperage, duty cycle, voltage and the RPMs of the cooling fan. Built into the display is a seven menu control interface. These menus allow you to set the desired current draw, and also to turn on advanced features like voltage sensing menu that turns the unit on and off automatically with the engine. Voltage sensing systems are very advanced but simple. Just connect the power wire to any positive connection. With the engine running, the alternator produces 14 volts through the charging system and the unit will turn on. As soon as the engine stops or the voltage drops down to 12 volts, the system shuts down and waits for you. And if that's not enough, this unit may also be modified to indicate a low water level in your tank. You will need to install a float sensor to utilize it, but it's there when you are ready.